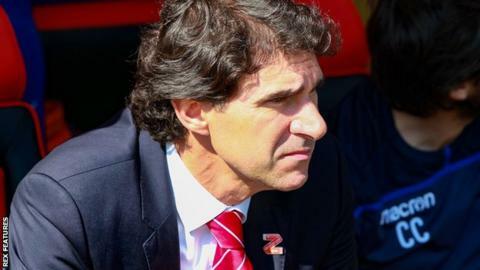 Nottingham Forest manager Aitor Karanka says he wants his team to repeat the form that saw them beat Premier League Newcastle, after they lost at Brentford in Championship. Having won a Carabao Cup tie in dramatic circumstances on Wednesday, Ollie Watkins' late strike saw Brentford clinch victory and end Forest's unbeaten start to the season. "We need to be consistent, we need to play in the way that we played against Newcastle," said Karanka of his side - who have won just once in the league this season despite making a number of big-money summer signings. "In the following game we need to do the same, not just for 20 or 25 minutes, we need to take that balance and be a consistent team and intense team to go forward." Bees forward Watkins converted Said Benrahma's cross from close range after Matty Cash's 25-yard effort had levelled for the visitors. Dean Smith's side, without suspended top scorer Neal Maupay, saw skipper Yoann Barbet, Sergi Canos and Chris Mepham all waste good chances before Lewis Macleod headed home Benrahma's cross seconds before half-time. But Watkins was on hand to beat Forest keeper Costel Pantilimon and seal the points in a feisty encounter that saw 12 bookings. The hosts went closest to opening the scoring in a dominant opening period when Josh McEachran's low free-kick found Barbet, who shot just wide from inside the area. In reply Forest striker Gil Dias tested Bees keeper Daniel Bentley, but he held the on-loan Monaco forward's shot comfortably. Brentford wanted a penalty when Macleod went down next but referee Peter Bankes showed him a yellow card for diving. Forest debutant Michael Hefele and Barbet were also booked in the melee that followed the decision. The Bees continued to probe as Canos burst into the area but Pantilimon saved the Spaniard's shot with his legs. Seconds later, midfielder Romaine Sawyers found space on the edge of the box but drilled his shot wide of the target before McLeod broke the deadlock in added time. Brentford almost doubled their lead in the opening seconds of the second half as Hefele misdirected a clearance towards his own goal, but Pantilimon was alert to palm it behind. Forest boss Aitor Karanka's double change at the interval paid off as Cash, on for Joe Lolley, squeezed his effort past Bentley from long range. The visitors came into the contest as another substitute, Ben Osborn, also shot narrowly wide from 25 yards. But the resilient Bees hit back through Watkins to move Forest down a place to 14th in the table despite their spirited second-half showing. "It was a tough game to play in because Forest posed some very different questions, but we have problem solvers all over the pitch now. "That side of their game shows they have moved up to the next level and I was delighted with that because they had to show a lot of character today. "I thought they'd have to change things at half-time and they put two wide men on and that gave us a few more problems, but we went toe to toe with them and deserved the win." Match ends, Brentford 2, Nottingham Forest 1. Second Half ends, Brentford 2, Nottingham Forest 1. Said Benrahma (Brentford) is shown the yellow card. Lewis Grabban (Nottingham Forest) is shown the yellow card. Jack Robinson (Nottingham Forest) is shown the yellow card. Offside, Nottingham Forest. Ben Osborn tries a through ball, but Lewis Grabban is caught offside. Goal! Brentford 2, Nottingham Forest 1. Ollie Watkins (Brentford) right footed shot from very close range to the centre of the goal. Delay in match Ollie Watkins (Brentford) because of an injury. Offside, Brentford. Chris Mepham tries a through ball, but Said Benrahma is caught offside. Substitution, Brentford. Nico Yennaris replaces Lewis MacLeod. Ben Watson (Nottingham Forest) is shown the yellow card. Foul by Lewis Grabban (Nottingham Forest). Substitution, Nottingham Forest. Lewis Grabban replaces Daryl Murphy. Substitution, Brentford. Kamohelo Mokotjo replaces Josh McEachran. Substitution, Brentford. Alan Judge replaces Sergi Canos. Attempt missed. Daryl Murphy (Nottingham Forest) header from the centre of the box is close, but misses to the right. Assisted by Tendayi Darikwa with a cross. Corner, Nottingham Forest. Conceded by Chris Mepham. Goal! Brentford 1, Nottingham Forest 1. Matthew Cash (Nottingham Forest) right footed shot from long range on the right to the bottom left corner. Assisted by Daryl Murphy. Attempt saved. Romaine Sawyers (Brentford) left footed shot from outside the box is saved in the bottom right corner. Assisted by Josh McEachran. Attempt saved. Sergi Canos (Brentford) right footed shot from the left side of the box is saved in the bottom left corner. Assisted by Romaine Sawyers. Attempt missed. Ben Osborn (Nottingham Forest) right footed shot from outside the box is close, but misses to the right. Assisted by João Carvalho.